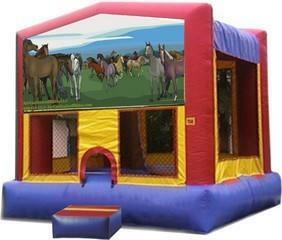 Themed 15x15 Moonwalk/Castle bounce 15'4" x 14'4" Rental, delivery, set-up, take down, and return. Includes stakes and/or sandbags/water containers for anchoring unit, ground cover and entry/exit mats. Also includes 50' lighted electric cord and GFCI cord. 9-10 small children (age 8 years & under) or 6-8 children (age 9-12 years) at a time with a 500 lb. limit. Minimum height 30" tall. This is a standard sized unit.